Orang Utans, Colonial Sandakan and Off to Brunei. 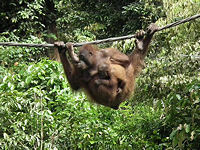 The following morning we also witnessed another excitement - the Orang Utan Rehabilitation Centre. 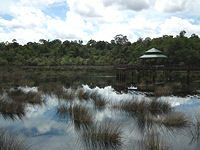 From the river pier we drove to the Centre, arriving just in time for a short film about the centre & the Orang Utans. Afterward we all headed into the jungle to see the feeding time at eleven o’clock. There was an additional excitement when one of the young Orang Utans came down from the trees & sat on the wooden handrail of the boardwalk pathway. This is the first time I came so close to an Orang Utan. The feeding platform looked like a small theatre waiting for the main actors to arrive. There was one already dangling around on the tree waiting patiently for the show to begin. 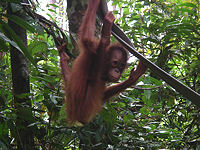 As more people arrived & gathered around another two Orang Utans arrived swinging from tree to tree & rope to rope. They are slow movers but very acrobatic with their long arms & legs. They move down from the ropes & tree branches when the staff lay out the fruits & vegetables to grasp their food & swing back up to the trees to eat it or perhaps sit on the platform to enjoy their meal. They are slow eaters too. Within minutes lots of monkeys began to appear from all directions to grab food from the platform. The Orang Utans did not seem to care & carried on with their own eating. The staff try to shoo the monkeys away but give up as it is impossible. The monkeys have probably eaten more than the Orang Utans at the end of the feeding. It is important though to understand that the Centre is for the rehabiliation and preservation of Orang Utans, and not a tourist attraction - visitors help to pay for the work of the Centre but the Centre is for the Orang Utans not the visitors. 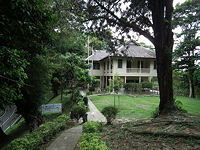 We drove back to Sandakan & began a colonial tour starting with a lunch at the English Tea House & Restaurant up on a hill overlooking Sandakan town. We had a 3 course lunch with pumpkin soup followed by fish & seasonal fruits for desert. The restaurant is restored but retains its 30's feel, the waitresses wearing the maids outfits and looking like extras from Brideshead Revisited. You can play a game of croquet on the lawn. Afterwards we visited the nearby Agnes & Harry Keith House which is now a museum. Next we visited the recently opened Sandakan Memorial Park. 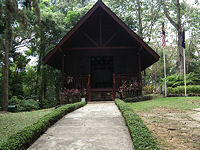 The park is adjacent to the site of the original Sandakan prisoner of war (POW) camp, and the visitor centre graphically tells the sad & true story of how British, Australian & other prisoners died under capture by the Japanese during 1942 to 1943. It also tells the remarkable story of the deadly long march for the prisoners from Sandakan to Ranau with just 4 Australian prisoners surviving out of the hundreds who set out. By late afternoon we were back at the English Tea House & Restaurant for tea, cucumber sandwiches and scones to finish the colonial tour. We took the early evening flight from Sandakan back to Kota Kinabalu. The whole of the next day was given over to hotel inspections. We visited the 5* Shangri-La Rasa Ria resort & also the 5* Shangri-La Tanjung Aru Resort, the 3* Tuaran Beach Resort, the 5* Nexus Resort & the 3* Beverley Hotel. We are using all these city & beach hotels for our tours. We took the late afternoon 40 minute flight to Brunei, arriving in the early evening & transferring to the 3-4* Orchid Garden hotel. Brunei is a tiny country smaller than Wales with a population of under 400,000. The Sultan of Brunei is a well-known figure among the British Royalty playing polo with Prince Charles & attending the recent Royal wedding of William & Kate. Next day is the now famous 29th April wedding day for William & Kate and is also my colleague Rob’s birthday. This morning our guide, Bin, took us for a trek in the jungle. He took us on the old road to Tutong town. This is a small local town by the river with local shops & small local cafes by the road side. The charm of this town is that it is non-touristy. All the cafes are full of local people having their mid-morning break drinking tea or eating the local speciality, sticky rice wrapped in banana leaves. We tried it & it is delicious. We were back to the road & arrived at the Forestry Reserve & Research Centre to see some flora & fauna from Brunei’s rainforest. Unfortunately the Centre was closed on Friday (Muslim weekend). ao we drove onward to Luagan Lalak Recreational Park. This is a park for the many locals who come here for fishing & picnicing. Further on the road we stopped at the start of a trail into the forest in the Sungai Laing Forest Reserve. This is a thick forest lowland with trails to a small waterfall. The same sounds of jungle re-appeared in my ears like in Kinabalu park as soon as we entered the forest trail. In this trail we saw monkeys flying across the tall treetops. The sounds of the insects & birds are loud & continuous following us like an echo. It is very refreshing & relaxing. All worries, irritations or even anger in one's head would disappear in the jungle symphony. We reached the waterfall in Wasai Mendaram. 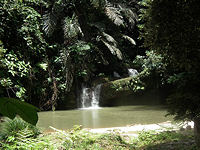 It is a small & natural waterfall with a large rock pool good enough for a dip. There is also white sand in front of it looking like a little private beach. If our guide had brought a picnic for us I would have gone in for a swim to cool down. My sweat was running through my t-shirt making it stick to my body. It was a very hot day. After a rest we walked back to the car & visited the nearby Mendaram Longhouse. Many families are still living in this traditional longhouse. Children are very friendly & would come out & welcome you to their house. The strange thing in this longhouse is that they have many birdcages with different kinds of birds hanging before the entrance of the house while the jungle is only on the other side a few metres away. We drove back towards the capital, Bandar Seri Begawan, stopping at a shopping centre for our lunch. 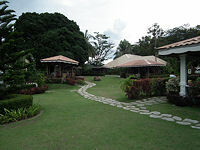 Due to it being a local shopping area the restaurant was simple in style but the food was memorable. We had Chinese roast chicken, brocolli & fried prawns in chili sauce. They were delicious. The chicken was tender & tasty, the chilli prawns were outstanding & memorable but the brocolli was cooked to perfection. This is one of the many memorable meals that I would list as the best in my travelling years. The most remakable thing is that it was just a simple local restaurant.